At the heart of the circuit is a NOS PNP germanium transistor coupled with a silicon NPN transistor. We found the magic pair to give you the sweetest harmonic generation and most dynamic playing response. The Karma Suture is capable of a wide range of sweet, even-order harmonic distortion responses – from heavily saturated fuzz tones, to big and open overdrive, to a sparkling boost. And no matter how you have the pedal set, the tone and response is always alive, sensitive to your every playing nuance. The original Harmonic Percolator had only two controls, “Harmonics” and “Balance” controlling the input level (fuzz) and the output level respectively. We kept these controls, renaming them with words that describe the attributes that they actually control INPUT and OUTPUT. To overcome the control surface limitations of the original circuit, we developed the exclusive DIODES and DENSITY controls that give you complete control over the amount of clipping and compression and frequency response. The addition of these two controls permits the Karma Suture to be paired with virtually any guitar and amp. 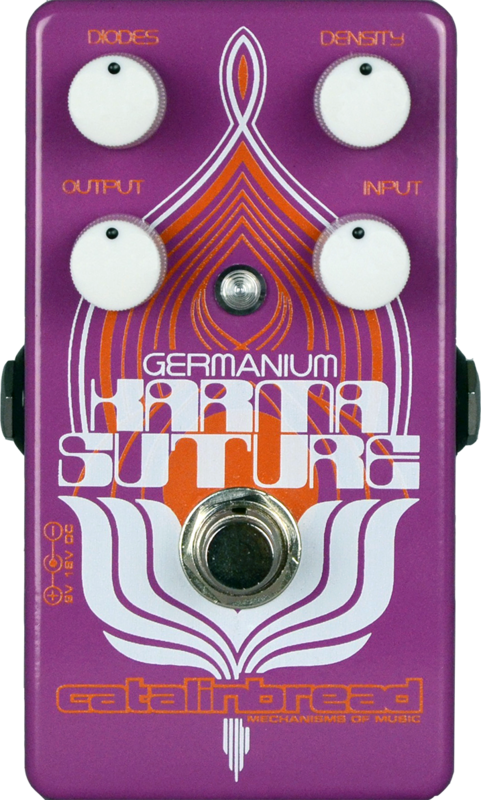 You’ll find that the Karma Suture will have the potential to enhance your pedalboard in a huge variety of ways. Use it as an amazing fuzz. Use it as a harmonically enhancing boost after an overdrive to really get that part to stand out in the mix. Use it as your only overdrive pedal. Use it to add new life to your wahs, phasers, and other effects. It can be subtle. Or it can be over the top. After you’ve had some fun playing and getting a feel of what each knob seems to do, you may feel the need to learn more about your Karma. In which case, read the manual!